It feels like years ago that a lovely journalist called Ruth Stokes asked to interview me for her book. We sat in Maison Bertaux cafe in Soho for a few hours & kept in touch. She updated me on her craftivism activities: first joining in our Tomato Jam project & then stitching a handkerchief for her MP. It’s really exciting to read her book about her journey into different forms of activism to find out what fits her personality and talents. I know I will sound biased saying this but I really do recommend people read the book. I don’t have a Kindle but my phone & laptop both have apps on so I can read it from there. Ruth is extremely honest about her nervousness and scepticism of the different activism techniques she tries out & tells you about it in a very clear and thoughtful way where you really feel you are on the journey with her into the world of activism. Would you change the world, if only you knew how? Do you dream of doing more than signing online petitions but don’t want to camp out on a pavement to prove a point? Are you frustrated because you’re not making a difference but don’t want to turn your life upside down in the name of action? 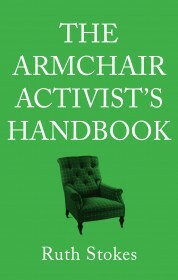 THE ARMCHAIR ACTIVIST’S HANDBOOK will help you find easy and fun ways to make the world a better place. Funny, honest and above all inspirational, this book will show how even the tiniest changes to your habits can have a positive impact, whether it’s to do with what you eat, how you dress, how you travel or even how you bank. Because if you stick with those changes for the long term, then you can help make great things happen. Ruth Stokes felt the same anger as people who went to extreme lengths for their causes but she did not have the time or the inclination to go as far as they did. And so she set out on a quest to find ways to make a difference which would fit into her life rather than taking it over. The result of her journey is THE ARMCHAIR ACTIVIST’S HANDBOOK, Ruth’s account of discovering how she could change the world without getting dirty and cold, without getting a criminal record and without hurting herself or anyone else. In the process, she got involved with a web of hidden organisations, projects and people making a genuine difference in ways she never knew existed. If you want to do a bit of good for the world and put a smile on your face, then you need to become an armchair activist too. The book is available from Amazon. Click here to buy.